Hansgrohe > Rainmaker Select 460 3 Jet EcoSmart Shower (White & Chrome). Hansgrohe Rainmaker Select 460 3 jet Showerpipe EcoSmart shower pack in white and chrome. With thermostatic valve, riser rail, head, handset and hose. 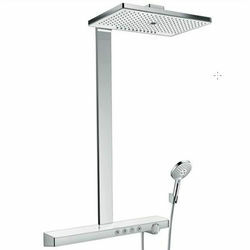 Raindance Select S 120 hand shower included with 3 jets and select button to comfortably switch between spray modes. 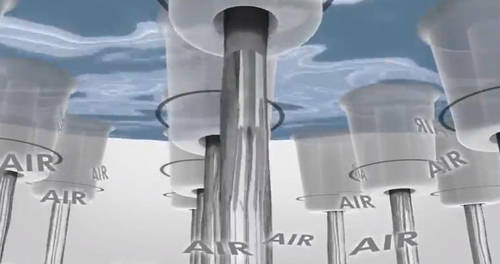 Handset spray pattern: RainAir (rain jet enriched with air), Rain, WhirlAir (massage spray). 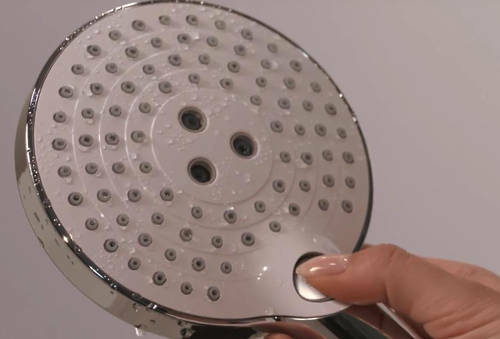 Hand shower head size: 125mm. Handset holder and hose included. Rainmaker Select 460 EcoSmart 3 jet overhead shower head (Rain, Mono, RainStream, 460x300mm). 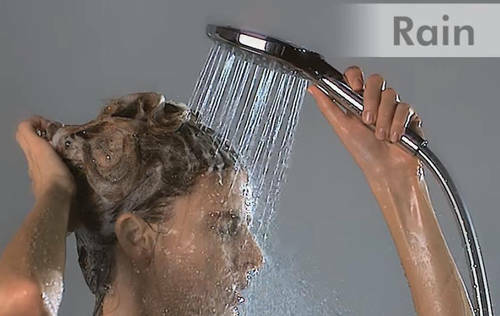 Shower arm length: 450 mm. Thermostatic valve (ShowerTablet Select 700). Safety water temperature stop at 40°C (adjustable hot water limitation). QuickClean technology for easy limescale removal. Operating pressure: 2 bar to max 10 bar. Flow rate 9 l/min at 3 bar. Select button to comfortably switch between spray modes. Exposed design allows easy installation, all working parts are outside of the wall. If running with a pump, please specify a universal (negative head) pump. Design: Gold Award winning handset 2015. 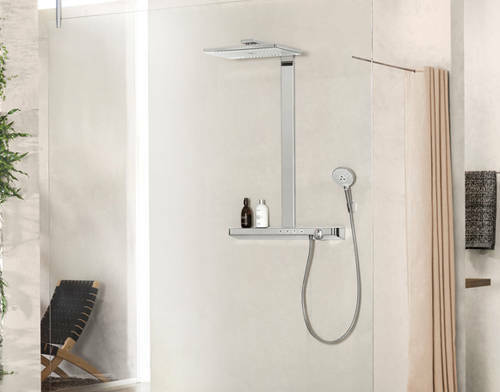 5 Year guarantee: Hansgrohe guarantee this shower for 5 years. 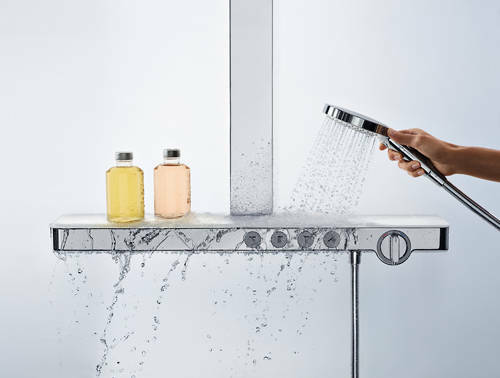 Hansgrohe is one of the leading sanitary companies and manufactures showers, taps and bathroom accessories of the highest quality in terms of both form and function. As a result, customers all over the world derive long-term enjoyment from them. 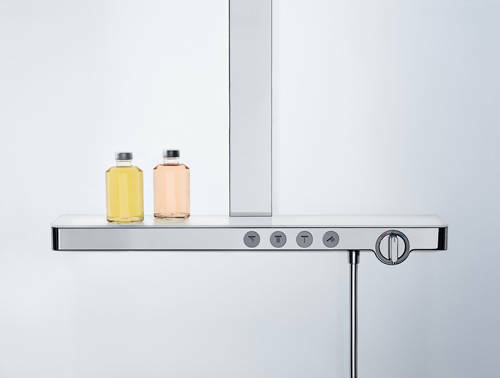 The Hansgrohe brand has set really high standards and uses high-quality materials which are suitable for use with drinking water and which have been subjected to endurance tests. Since 1901, bathroom pioneer Hans Grohe and his descendants have traditionally been one step ahead of their time. Outstanding bathroom product design, environmentally friendly technologies and innovative strength from this multi Award winning company.